SwordHero comes complete with Scene Cards, Story Cards and Instructions. This is it! SwordHero can now be ordered on the “Buy” page! Hurrah! Wired the money yesterday! 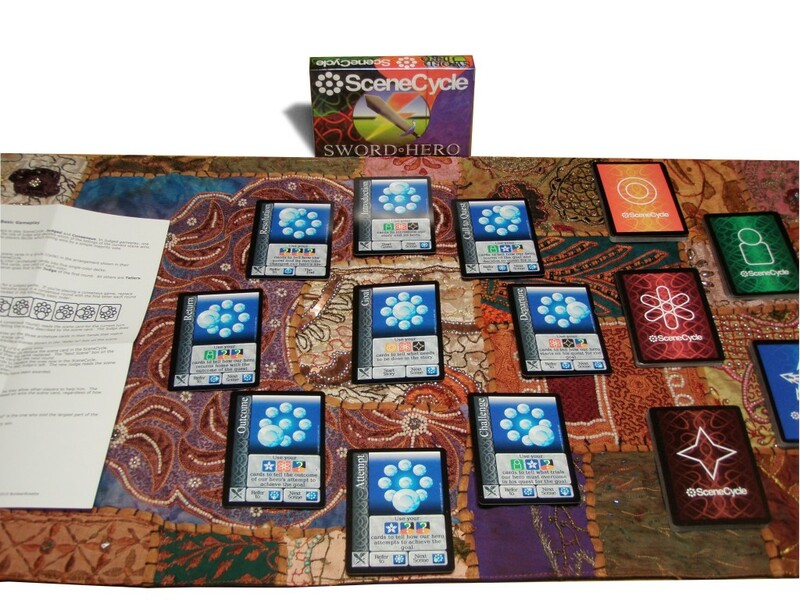 The first large production run of SceneCycle is in production now! After much preparation, the first mass production run of SceneCycle is going to be starting in a week or so. By mid-October the games should have arrived from the publisher and I can start making the rounds to Richmond local game shops and bookstores as well as working to get on Amazon. Sword Hero Goes to Version 2! Sword Hero version two is now on thegamecrafter.com! Numerous small improvements and clarifications will help you tell whatever story you want! www.thegamecrafter.com is currently making SceneCycle: SwordHero. They’ve really helped get this thing off the ground. The next step is going to be a large production run. Kickstarter.com is going to be the focal point of this next push. If we can pre-sell enough decks, we can get nice tuck boxes and a much greater supply. Videos are being shot soon to get everyone excited about SceneCycle! To get your copy of SwordHero, the first SceneCycle deck! SwordHero is currently finishing its first dry-run with thegamecrafter.com. As soon as everything has been approved, it will be “go time” and SceneCycle will be available for you to buy!